Hello All, I am new to the AmpliFI family, just received an Amplifi HD yesterday to replace an Aging and severely Overheating Buffalo Wireless router..
My Set Up: I have Gigabit Fiber to the curb connection with Fiber/Ethernet converter mounted on my outside wall. From that converter there is just an Ethernet cable ran inside. I have a Sony Bravia TV with AndroidTV system. The connections: OKAY, I set up the router and extenders, quite simple and the wifi works as it should. I have ran an Ethernet cable from the router to both my TV and my main computer. 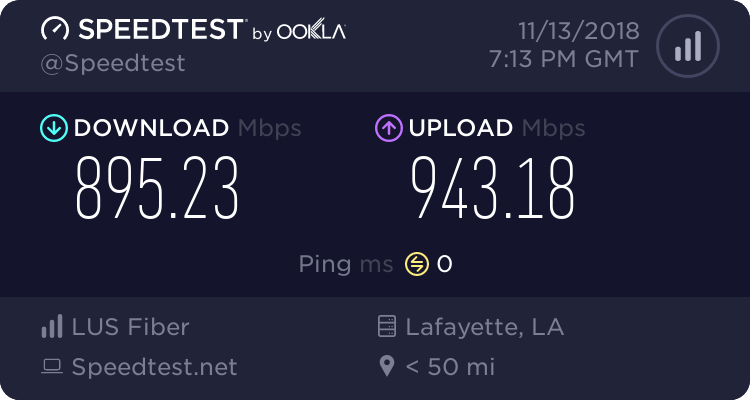 Speedtest on the computer yields 980Mbits up/down, so it seems to be working correctly. The Problem: I cannot stream reliably to the AdroidTV. All channels stutter and buffer. Netflix 4k content never even reaches 480i, says 0.58Mbit on the netflix stream info. I have now taken the Main ethernet cable into a Dumb Network switch, from that switch I go to the TV and to the Amplifi Router. Now the TV streams perfect again and the WIFI and computer still have peak performance, computer near gigabit through the router. Well, I want to not have this dumb switch . What in the router might be throttling the AndroidTV connection and send the gigabit to my computer with no issues? I have a slower connection and I did the following in the app to improve network performance. If it shows "Normal Priority" click the arrow to change it to "Optimized for Streaming". @lars-henson, @James-Earl-Ford is right, but QoS in the AmpliFi app is for wireless clients, and you stated that your TV is hardwired. What speeds are you getting from that ethernet cable without the dumb switch? Test this by taking that ethernet cable out of your TV and plugging in a laptop, then run the speed test. Connecting an unmanaged switch and that correcting the problem is strange behavior indeed. Try swapping your TV between ports 1-4 as well. It really seems like it an issue with my Sony AndroidTV.. The streaming is fixed by restarting the TV. It works for a few days, then starts streaming slow again, restart and back to 4k streams.. The issue is only when it is through the router though, so maybe some odd combination of router and TV ..